This is a straight and direct message to everyone on this planet. YOU NEED TO UPDATE YOUR ANDROID MOBILE PHONES, TABLETS etc.. NOW!! How many amongst you have an Android device? Are you aware that actually, billions of people around the world are impacted by a vulnerability called Stagefright? After the announcement was made on 27 July 2015 by Joshua Drake of Zimperium, I still noticed that there are many people who are not at all aware of this vulnerability and its devastating effect. You can download the FREE app at the Google Play Store to verify if your mobile phone is vulnerable or not. The aim of this article is to sensitize everyone to update their Android devices. Please do inform your friends and everyone around you. Please take note that there are some companies which have not yet released those patch. In that case, I encourage everyone to voice out their opinions with the help of Twitter. Note: Some Android cannot be patched as the vendor is not sending any updates. In that case, you can disable “MMS on reception”. But that does not keep you 100% safe! Click here – This may interest Security Experts and Software Engineers. Adding a new disk on FreeBSD is just a matter of minutes. As usual in the field of system administration, I need to do some pre-checks first before carrying out any operation. There are many documentations available on the Official FreeBSD Handbook. However, I create this blog post so that we can discuss more on it. 1. Start by retrieving the trace from dmesg. I fired this command and redirect it into another file. 2. You can also redirect the output of the df -h and or gpart show command. 5. Then, I made a diff dmesg1.txt dmesg2.txt to compare both dmesg before and after insertion of the disk to be assured that a new disk has been detected. As you can see the result was awesome the new disk “ada1” was detected. 6. Now, we can need to check if we are using GPT or MBR. Through the gpart show command, we already know we are using GPT. If you have encountered a Kernel Panic which usually happens after a major change in the Linux System, you can follow these procedures to rebuild the Kernel files with Dracut tools. Boot the server on rescue mode or simply through a live CD or ISO. To boot the server on rescue mode login on the Vsphere Interface and look for a live CD. In case of Kernel Panic on your own machine, you can boot your machine with a live CD. After the mount operations have been carried out, you need to access the directory by chrooting into it. You can umount all partitions and /or simply reboot the machine. On Vcenter, you may need to boot go through the BIOS interface first before being able to boot through the ISO and force the BIOS screen to appear on your screen. You may also use the Finnix ISO which is usually compatible with all UNIX system. To know which kernel version your machine is actually using, you need to get into the grub folder and look for the grub.conf. The first option is usually the kernel used by default. Sometimes, you need to try with the same version of the OS, it may happen after you have boot your machine with a live CD, the ISO which you have used do not detect your disk or the data store. You may, for example, think the disk is not good or there is a problem in the SAN. However, without doing a root cause analysis, you cannot be certain if by repairing the initrd the Kernel Panic might be the unique solution. 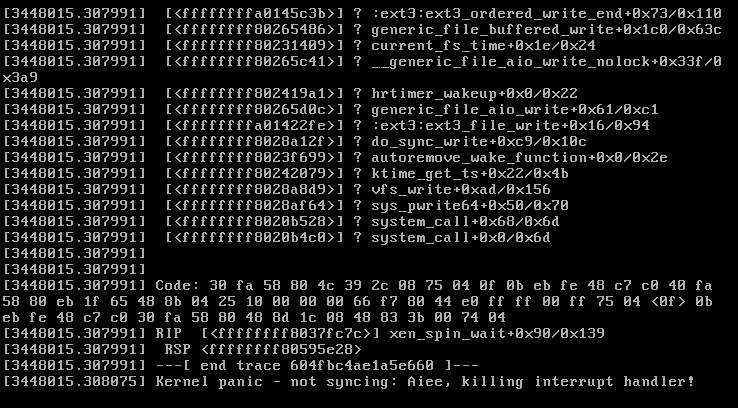 There are circumstances where a mounted NFS is not the same version with the actual machine which can result in Kernel Panic. The Dracut solution is not a definite solution. Always investigate on the Dmesg log if possible or the crash dump if same has been set up. 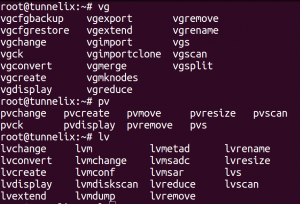 After a little introduction about LVM from the article Managing LVM with PVMOVE – Part 1, its time to get into the details of the pvmove command. Based on the scenario and constraints described in part 1, that I will elaborate on the pvmove operation here. So you might ask yourself how come if you perform a df -h on your machine you find that lvsql total size is 15G and that of lvhome is 80G making a total of 95G when the hard disk is a 100G [As described on the diagram above]. Is there 5G missing? The answer is no. When you fire the command pvdisplay, you will notice that the “PE Size” had consumed 5 GB. For example on this screenshot on the left, the PE Size is 4MB. Usually, the 5Gb missing will be allocated there which means that the PE Size is used for a specific purpose for example in our situation a back up of the MySQL database or other processes. If the missing size is not found it means that its still in the VG and has not been allocated to the LV. It’s important to allocate some additional space there. So before start do a pvdisplay, lvdisplay, and vgdisplay as well which are important. We now have our sde hard disk as described in this picture below. How to start? It’s up to you to decide which lv you want to allocate more space as you have control over the vg. You can also add another physical disk and extend the vgname and resize the lvsql since a database usually grows in size. Once all applications have been stopped you can type the mount command to check the presence of the partitions as well as you have to confirm that there is no application writing on the disk – use lsof or fuser. Comment the two lines related to the 2 vg partitions in the /etc/fstab file. Usually it would be the lines /dev/vgname/lvsql and /dev/vgname/lvhome. You can now umount the disk. You would notice that it would not be possible to umount the partitions if ever an application is writing on it. Another issue is that if you have ssh running on the machine, you need to stop it! Then, how do you ssh on the machine? Use the console from vSphere or if it’s a physical machine boot it with a live cd. Next step is to do a lvreduce of the lv if possible according to the size. In our case 5GB being used out of 80. Do a lvreduce -L 7GB –resizefs /dev/vgname/lvhome. This is done because when you will move the pv it will be faster. The bigger the lv the more time it takes. Now the magic starts, fire a pvmove /dev/sdb /dev/sdc – This means that you are moving the pv allocated to the vgname belonging to the PEs of hard disk sdb into sdc. One of the challenging issues that I have encountered is the manipulation of LVM – Logical Volume Management on virtual servers. Whilst writing this article, I noticed that I have to split it into parts as it looks bulky in some sort. Once you have understood the logic of the LVM, things get pretty easy to deal with. I will elaborate some details of LVM, and will surely get into some brief real-life experience that is important to grasp. Let’s take an example of a disk where there are some applications running like MySQL, Apache, some monitoring tools like Atop and Htop which are writing on the disk and we have to shrink that very disk or replace it with another disk. Let’s also assume that the server is running on an ESX host and the operation will be carried out through the VMware VCenter. How do you shrink a disk having its application generating IOs? 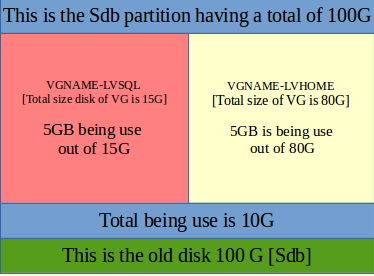 How do you replace a disk with a smaller one having its data on an LVM? In brief, here is what I have understood from what is LVM – Logical Volume Management. We have Physical Volume (PV), Volume Groups (VG) and Logical Volume (LV). These terms are a must to understand before proceeding with Logical Volume Management operations. VG – The Volume Group is the highest level of abstraction used with the LVM. Does this term look complicated? I would say no. In the field of Software Engineering, there are two terms that are usually used that is modeling and meta-modeling. Just understand it like this if you are not familiar with software engineering. Modeling means one step or one level removed from reality whilst Meta-Modelling means modeling at a higher level of logic. So basically, it looks like some sort of higher modeling happened at the level of the VG. LV – The logical volume is a product of the VG. They are disks which are not restricted to the physical disk size and it can be resized or even move easily without even having your application to be stopped or having your system unmounted. 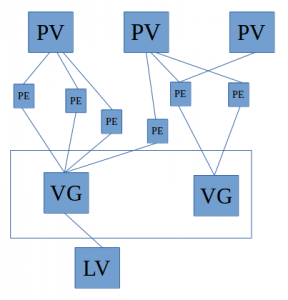 Of course, I need to do more research to get into a more deeper explanation of the PV, PE, VG, and LV. Lets now see an explanation through my horrible drawing skills. The VGs are just a high level of abstraction that should look from the above. VGs are created by combining PVs. Those physical disks can be picked up from the datastores, where RAID is configured. This act as another layer of security to be able to handle disk failures or loss of data at all cost. 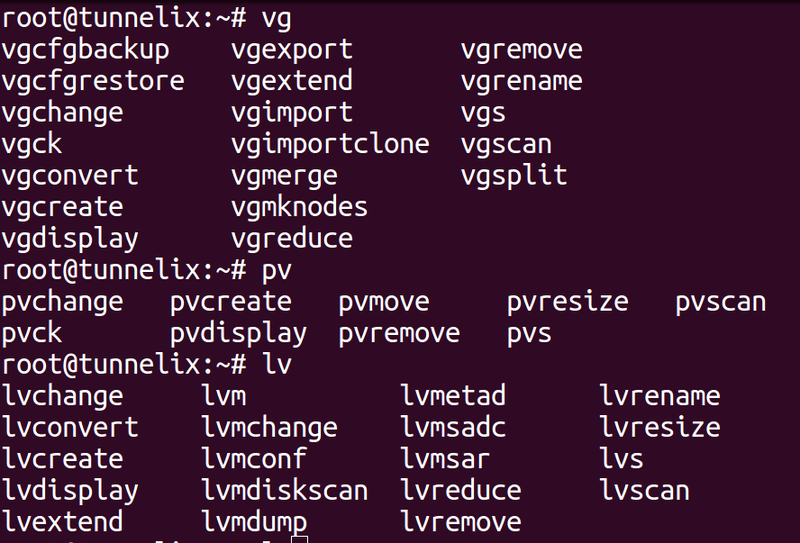 On Linux, if you type vg or lv or pv press tab twice you will have an idea all the commands that exist and possibilities of manipulation. On part2 of this article, I will take an example of the pvmove command and actions that could be done to minimize impact before carrying out a pvmove operation.